The practice of exchanging greeting cards has a very long history, but the modern Christmas card tradition really got its start in the 1840s. Changes in postal services made it affordable for ordinary people to send each other cards, and developments in printing technologies gradually made it cheaper to produce cards commercially. Plus, Queen Victoria was doing it, which is how a surprising number of our modern Christmas traditions became popular. In Australia, it wasn’t until the 1880s that sending Christmas cards started to reach the heights of popularity. 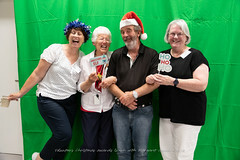 For most of Western Australia’s post-colonial history, people have been sending and receiving Christmas cards, and the State Library of Western Australia holds a surprisingly large number of them. To modern eyes, early Christmas cards from Western Australia don’t seem all that Christmassy. One of the earliest dated cards in our collection was produced by the Perth Postal and Telegraph Company in 1887, and was part of a tradition of Postal Services around the world exchanging Christmas courtesies between themselves. The card features sketches of Perth and Fremantle, and also of a pearling fleet. The Western Mail at the time described the imagery as “suggestive of the youth and vigor of this young country.” This card is part of a larger collection of greeting cards collected by Emily Prinsep, and came to the library as part of the Prinsep family papers. Others were more like picture postcards showing places or events throughout the year, with Christmas messages attached. These two examples show views of Mounts Bay Road and the Narrow with inserts of a cycling race from around 1896; and a view of Perth esplanade on June 20th 1897, with festivities for Queen Victoria’s Diamond Jubilee. They may have been produced by early photographers as a way of advertising their services or reselling existing images, but from a modern perspective it can be hard to see the Christmas connection. One early card that is more Christmassy features a setting of an original Christmas carol, estimated to date from about 1890. The lyrics are by Henry Ebenezer Clay, who was a notable but somewhat uncelebrated Western Australian poet. The music was written by Sir William Robinson, who served three times as Governor of Western Australia; from 1875 to 1877, 1880 to 1883, and 1890 to 1895. Robinson was quite a well-regarded composer, and a number of his songs were popular in Australia at the time. By the early 20th Century, a wide range of consumer cards were available and being exchanged by Western Australians. In the collection of records from the Young Australia League is an album of Christmas cards and other greetings, mostly sent to the League’s founder J.J. Simons from around 1911 to 1914. This shows the diversity of cards which were being sent at the time, including items designed and printed in Western Australia. Much of the imagery was still about the place the card was sent from, or floral and springtime. In fact, some cards came with small packets of seeds for the plants which they represented. Floral images were featured on the very first commercial Christmas cards produced in Australia, and local flowers remained a popular theme. Amongst others, this card produced by the WA State Government Printer in 1912 features a rich illustration of Western Australian wildflowers. Businesses were getting in on the act, as well. Many corporate Christmas cards were fairly plain, not much more than calling cards, but there were creative solutions too. The property company Peet and Company was one. While they had their fair share of serious cards, in the 1920s the company produced a novelty cheque for the payment of “ten thousand good wishes for Christmas and the New Year” for their Christmas messages. While there was a rich marketplace of commercially-produced cards available in the early 20th Century, it was not uncommon to send handmade cards as well, particularly if you were of an artistic bent. The artist and illustrator Amy Heap made this delightful view of the Swan River for a Christmas card in 1913. It was found in the collection of Frank Allum, who was Chief Clerk and later Deputy Master of the Perth Mint. Both Heap and Allum were members of the West Australian Society of Arts, and it is likely that the card was exchanged in that context. We also hold a substantial collection of handmade cards produced by the “Brierley girls” in the 1920s. These were probably the daughters of the Brierley family who settled at Balangup, on the Frankland River west of Mount Barker, in 1913. Many members of the family were skilful artists, and these handmade cards certainly demonstrate that. The images are heavily European, but then the family had only emigrated from England about ten years prior to making the cards. These cards were later sent en masse to William Elsey, the Bishop of Kalgoorlie, and it’s in the Elsey family papers that they came to the library. Elsey had first met the Brierley family as an itinerant Clergyman in the Diocese of Bunbury, and they remained family friends. Some of the more poignant cards in the State Library of Western Australia’s collection come from people celebrating under challenging circumstances. In the collection of Major A.E. Saggers are handmade Christmas cards exchanged between Australian soldiers who were prisoners of war in Singapore in 1943 and 1944. Saggers wrote a memoir of his experiences, and by 1944 his unit had already been captured in Singapore, sent to work building the Burma-Thailand railway, and been returned to Singapore after its completion. What’s striking about these cards is how good-natured they are, and how the senders managed to find positivity and even humour in trying conditions. By the 1950s, what we would recognise as contemporary Christmas imagery was becoming established in Western Australian Christmas cards. Percy Dix established the printing company Dix Print in the early 20th Century, and went on to make a tradition of producing humourous Christmas cards with his face on them every year. By the 1950s, these included familiar Christmas images such as wreaths and Santa Claus outfits. Religious imagery seems less common that you might expect in the Christmas cards in the State Library’s collection. The exception, of course, is cards sent from religious organisations. This card was sent by the Parish of Williams, in the Western Australian wheatbelt, in 1952. It is part of a substantial collection of greeting cards collected by the Haynes family, who had farmed in the Williams and Quindanning districts since the late 19th Century. The second half of the 20th Century also saw a flourishing of businesses sending Christmas cards. There are myriad examples, but some are found in the records of the Swan Brewery. These cards were sent in the 1960s, and feature images of various buildings that the brewery had operated from, including the art deco building on Mounts Bay Road which no longer exists today. New Christmas cards are still being produced all the time, and the State Library regularly collects new cards. One recent example from the State Library’s collection is a series of cards commissioned by the William Street Collective in 2012. These feature local Western Australian artists such as Luisa Hansal, Anya Brock, Jen Garland, Martin E. Willis, The Yok and Lisa Max, and were available for free from various sites along William Street, just outside the State Library of Western Australia itself. In 1888, a Melbourne journalist predicted that “the Christmas card craze has reached its climax and will probably decline.” In the 130 years since that prediction, Christmas cards certainly didn’t decline, and were created and exchanged in enormous numbers. At the State Library of Western Australia, Christmas cards can be found in our ephemera collections, in our pictorial collections, and spread throughout the private archives collections as items received or created by individuals and businesses. 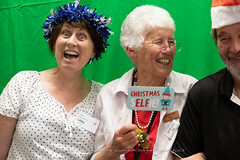 In writing this piece, it became apparent just how many Christmas cards the State Library holds, and we have only scratched the surface. There is so much more to discover, but then that’s true of all of our collections. Through the mirror-glass: Capture of artwork framed in glass. State Library’s collection material that is selected for digitisation comes to the Digitisation team in a variety of forms. This blog describes capture of artwork that is framed and encased within glass. So let’s see how the item is digitized. Two large framed original artworks from the picture book Teacup written by Rebecca Young and illustrated by Matt Ottley posed some significant digitisation challenges. When artwork from the Heritage collection is framed in glass, the glass acts like a mirror and without great care during the capture process, the glass can reflect whatever is in front of it, meaning that the photographer’s reflection (and the reflection of capture equipment) can obscure the artwork. This post shows how we avoided this issue during the digitisation of two large framed paintings, Cover illustration for Teacup and also page 4-5 [PWC/255/01 ] and The way the whales called out to each other [PWC/255/09]. Though it is sometimes possible to remove the artwork from its housing, there are occasions when this is not suitable. In this example, the decision was made to not remove the artworks from behind glass as the Conservation staff assessed that it would be best if the works were not disturbed from their original housing. The most critical issue was to be in control of the light. Rearranging equipment in the workroom allowed for the artwork to face a black wall, a method used by photographers to eliminate reflections. We used black plastic across the entrance of the workroom to eliminate all unwanted light. The next challenge was to set up the camera. For this shoot we used our Hasselblad H3D11 (a 39 mega pixel with excellent colour fidelity). Prior to capture, we gave the glass a good clean with an anti-static cloth. In the images below, you can clearly see the reflection caused by the mirror effect of the glass. Since we don’t have a dedicated photographic studio we needed to be creative when introducing extra light to allow for the capture. Bouncing the light off a large white card prevented direct light from falling on the artwork and reduced a significant number of reflections. We also used a polarizing filter on the camera lens to reduce reflections even further. Once every reflection was eliminated and the camera set square to the artwork, we could test colour balance and exposure. In the image below, you can see that we made the camera look like ‘Ned Kelly’ to ensure any shiny metal from the camera body didn’t reflect in the glass. We used the camera’s computer controlled remote shutter function to further minimise any reflections in front of the glass. The preservation file includes technically accurate colour and greyscale patches to allow for colour fidelity and a ruler for accurate scaling in future reproductions. The preservation file and a cropped version for access were then ingested into the State Library’s digital repository. The repository allows for current access and future reproductions to be made. From this post you can see the care and attention that goes into preservation digitisation, ‘Do it right, do it once’ is our motto. The Fairbairn collection includes over 100 artefacts of various types; clothing, a sword, hair ornaments made out of human hair, items used for sewing , just to name a few. All of these objects need to be stored in the best possible way. Housing is the process of making protective enclosures for objects to be stored in. By housing an object or group of objects we are creating a micro environment; temperature and humidity become more stable, direct light is deflected, materials are not damaged when handled or when placed on a shelf. Housing can be a box, folder or tray that has been custom made and fitted out to the exact requirements of the object. Inert materials and/or acid free board are used. Some of the objects in the Fairbairn collection required conservation treatment before they were housed. For example, the leather had detached from the front of this object but was reattached during treatment. Some objects required individual housing (for example clothing items, sword and shoes) but the majority of the objects could be housed in groups. These groups were determined by object type and the material it was made of (for example all the coin purses made from similar materials are in a group). This was done not only for ease of locating a particular object but because different material types can need different storage conditions and some materials can affect other materials if stored together (for example the vapours released from wood can cause metals to corrode). Each object was arranged to fit into a box in such a way so that its weight would be evenly supported and so that it can be retrieved without being damaged or damaging neighbouring objects. Then layers of board and/or foam were built up to support the items. Labels were placed to give direction on safely removing the objects from there housing. Labels were also placed on the outside of the boxes to identify what each box holds as well as the correct way to place each object inside the box. Custom supports were made for some objects. For example the internal support for this hat. Each item in the Fairbairn collection has now been housed and placed carefully into long term storage with the rest of the State Library of Western Australia’s collection. Not so long ago we received a trolley full of files from a private organisation. This is not an unusual scenario, as we often collect from Western Australian organisations, and it is part of the job of our Collection Liaison team to evaluate and respond to offers of content. The files we received included the usual range of hardcopy content – Annual Reports, promotional publications, internal memos and the like… and a hard drive. Not being totally sure what was on the hard drive, we thought we’d best take a look. We used our write blocker (a device to stop any changes happening on the hard drive), and accessed the drive. Well, we tried to… Challenge 1 was hit – we couldn’t open the drive. A bit of investigation later, (and with the use of a Mac), the drive was accessed. Funny to think at this point how used we get to our own ‘standard’ environments. If you are the only person in your family to use a Mac, and your drives are Mac formatted, how are you going to share files with Windows users? Once we could get to the content, we carefully copied the contents onto a working directory on our storage system. (Carefully for us means programmatically checking files we were transferring, and re-checking them once copied to ensure the files weren’t corrupted or changed during the transfer process). At the same time, our program created a list of contents of the drive. There were a mere 15,000 files. Challenge 2 started to emerge… fifteen thousand is a big number of files! How many files would you have on your device(s)? If you gave them all to someone, would they freak out, or would they know which ones were important? At about this stage, we peered across at the trolleys, neatly stacked with archive boxes full of paper, and started wondering if (or how much) of what was on the trolleys was replicated on the hard drive. How would we check this? Do we check this? If we do find duplicates, which one do we keep? Maybe we should keep both? Challenge 3 was now upon us – identifying and handling duplicates. In case we didn’t have enough to worry about, there’s a folder on the hard drive labelled ‘Archive’. Gulp. Sounds like more duplicates. Probably not an unfamiliar scenario for some of you dear readers? Now, I’ve saved the best until last (for this post anyway – we’re not quite done with the whole process). Challenge 5 is around being able to read/open files. It didn’t take long for us to identify that there were a bunch of files that we do not have the software to open. Without the ability to open the files, how can we evaluate them? Maybe we shouldn’t worry too much, as that might be the role of the researcher? (The equivalent hardcopy ‘problem’ would be having a book written in French – I can’t read it, but you might be able to). What is the common ‘language’ in your family? Are you a writer, editor, musician or film-maker? Have you produced your own book, magazine, pamphlet, CD or DVD for the public? Have you given a copy to the State Library? If you prepare and issue your own work to the public without the involvement of an established publisher, this is called self-publishing. When you give a copy of your self-published work to the State Library, the public can access it and learn of our history. The State Library carefully maintains your publication in its original state for many years to come. You will also meet your legal responsibilities (Legal Deposit Act and Regulations) that apply to self-publishers and commercial publishers. Your publication is protected from unauthorised copying by law (Copyright Act and Regulations), including your music and film. Official documents of the controversial Western Australian Shark Hazard Mitigation Drum Line Program. Post your publication to Legal Deposit, State Library of Western Australia, 25 Francis Street, Perth 6000. Or bring it with you to the State Library. You may also wish to donate a second copy, to help us preserve the first copy. For more information visit www.slwa.wa.gov.au, email legal.deposit@slwa.wa.gov.au or phone 9427 3348. There are many valued and interesting pieces of equipment necessary for us to properly treat objects in the lab. Let me introduce you to some of them! As the name suggests we use a board cutting machine to cut board. This machine is used daily to cut and crease boxes which are then folded and glued by hand. We also use the board cutting machine to cut out mats when framing objects, inserts to fit out boxes and backing boards. In fact anything that fits the dimensions of the table and is made of board may be cut using this machine. In the past boxes, folders and cutting mats were done by hand. It took approximately 40 hours to make 30 boxes. We are now able to cut up to 65 tailor made boxes per day, i.e. each book is measured and a perfect match is produced. Conservation is currently running a boxing program to house all our Rare Heritage materials. We box as a preventative measure to protect materials. By boxing we are creating a micro environment; temperature and humidity become more stable, direct light is deflected, materials are not damaged when handled or when placed on a shelf. A microscope is a handy piece of equipment to have around when your job is to see what is wrong with an object and to try to stop it from deteriorating further. Using a microscope to examine an object can allow us to see problems that cannot be seen by the naked eye and closely investigate problems in greater detail. Currently this microscope is been used on our photographic panoramas. Using a microscope in this example has allowed for tears to be correctly aligned; to consolidate flaking gelatine; to accurately repair small losses and assist with the application of a surface gelatine cote over both scratches and tears where necessary. The suction table is used for any porous 2-dimensional collection items, usually paper or textile. The perforated surface of the table is equipped with an adjustable suction level to suit various treatments, for example; localised washing of dirt and/or stains, controlled drying, lining and treatments where it is necessary to monitor humidity or use a liquid solution safely. The humidification chamber sits on top of the suction table and can be used for mass humidification, humidifying large objects or applying steam as the best option. We often humidify an item preparing it for flattening. Did you find this article interesting? Would you like to hear more about the conservation lab or our equipment? Please comment below with any questions, suggestions or feedback below. Digital Preservation vs Storage: Why is digital preservation different to digital storage? Digital preservation is about maintaining access to digital files over (long periods of) time, whereas digital storage is about keeping the digital items themselves. Though digital preservation includes storage of digital items (keeping the 1s and 0s that make up digital files) safe and sound, there is more than to it than that. In the same way that we look after our hardcopy heritage items, we need to keep the 1s and 0s of digital heritage items in the best conditions. Following (IT) industry standard, we back up our files in multiple physical locations, on different media, and make regular backups of our content. Doing this minimises the risk of any issues occurring (e.g. a physical disaster like a fire), and ensuring copies of our data are on different media helps protect against issues related to specific hardware (e.g. a bad batch of discs, or a certain type of backup tape becoming obsolete). For digital preservation purposes, when we receive a digital file, we take note of how it came to us. We look at what type of content it is (a text file, an image, a sound recording), as well as what file type it is (.doc, .jpeg, .mp3), and what type of software is needed to open or view the file. These pieces of information help us to know what to do with the file, and also what type of risks this file may be exposed to. File types can be considered at risk because of a number of reasons – the company that created the file type may abandon support of the program needed to open the file, or upgrades to software may result in older files becoming inaccessible. In DigitalLand, it’s very likely that certain files are only supported on certain computer operating systems, and sometimes those operating systems are hard to come by (Windows version 3.1 anyone?). When we receive files, we keep an exact copy of what we have received, as well as making a copy of the file in an open format (i.e. a format that can be used by anyone). We also create versions of the file (derivatives) for delivery over the web. Luckily for us, most of this processing happens automatically, so it’s not a matter of a person opening a file and saving lots of different versions of that file, which frees us up to collect even more files! 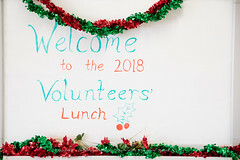 Even once we have made the different copies, and are confident that our backups are secure, our job is not yet over; as we need to stay tuned for changes that may mean that we need to migrate our files into new(er) formats, so we can continue to offer access to the files using current technology. We are regularly are seeing new file types emerge (e.g. 360 degree video), and are seeing many more digital files coming to us, as more and more people turn to digital methods to capture and re-tell their stories. Consolidate and make more than one copy of the files – copy all your files to one location, then make backups from that place to other media. Many people now have access to online (web) storage, as well as traditional media such as discs. Ensure you have the environment (software/hardware) that you need to open the file, and that you have all the peripherals you need (do you know where that cable or power supply you need to connect that hard drive is?). Where you need special software to open the file, and that software is ageing, can you save it to a modern format? Have you explored our Juniper App? The Juniper App showcases a series of artworks created in the 1970’s by prolific Western Australian artist Robert Juniper, and the children’s book which they were created for, “Mason Judy”. Mason Judy is the story of an eight year old boy who is lonely and unhappy when his family moves to a new suburb. He finds a magic stone which transports him to another time and place. There he meets the Guardian of the Stone, who takes him on a journey to return it to its traditional dwelling place. Along the way he undergoes many trials which test his strength of character. Author Trevor Todd wrote the Mason Judy story as part of a creative writing class in 1975; he gave his friends copies of his typed manuscript as Christmas gifts that year, and one of them passed his copy onto Robert Juniper, who offered to illustrate the book. The State Library was fortunate to acquire Robert Juniper’s work, with the assistance of the State Library’s Foundation. They are now part of a larger collection of original artworks from children’s literature held by the Library, the Peter Williams Collection. The development of the App was part of a wider project to provide universal access to the State Library’s rare material through digitisation and brings both the artwork and the story to a whole new audience. Through the App, users can explore both the story and paintings in depth, and through a supporting education program, explore the social and community environment at the time. Users can also enjoy listening to a reading by the author, and understand the perspective of an Indigenous curator, whose comments and insight can be seen alongside the artwork. Each year, the State Library of Western Australia contributes hundreds of Western Australian websites to PANDORA, Australia’s web archive. PANDORA is a world class web archive established by the National Library of Australia in 1996. It is built collaboratively by 11 cultural institutions across the country, with SLWA contributing Western Australian content to this ever-growing national archive. Websites are selected for their significance, their authority or research value, their representation of social or topical issues, and also to reflect the diversity of our state. These can include the websites of organisations, community groups, individuals, festivals, events, and sites about various topical and political issues, election campaigns, interests and activities. Web archiving involves selecting, copying (but only with the permission of the website owner! ), quality checking and preserving specific websites. For copyright reasons, SLWA can only archive a website if the website owner has given permission, so we will always contact the website publisher to ask permission before we archive. Once archived, the live website may continue to change or eventually disappear, but the archived instance will remain as it was at the time it was captured. The average lifespan of web content is difficult to determine, but various estimates suggest that an individual webpage may last on average as little as 100 days. That means that an awful lot of Western Australia’s web presence may be at risk of disappearing at any one time. Many of the websites preserved by SLWA are no longer in existence. For example, we archived the website of the Deckchair Theatre company from 2008, with the final snapshot captured just a few months before the theatre closed in 2012. We archived websites related to the Commonwealth Heads of Government Meeting held in Perth in 2011, including the official website and the 2011 Commonwealth Festival, which showcased arts and culture in Western Australia at the same time. These sites lasted until at least 2013, interestingly, but were eventually shut down as they had outlived their immediate usefulness to their creators. Less attractive perhaps, but just as important historically (and legally), are the websites of the WA health practitioners registration boards – Psychologists, Dentists, Occupational Therapists, Medical Radiation Technologists etc. – which ceased to operate between 2010 and 2012 when national registration came into effect. Web archiving also preserves changes in information and design over time. 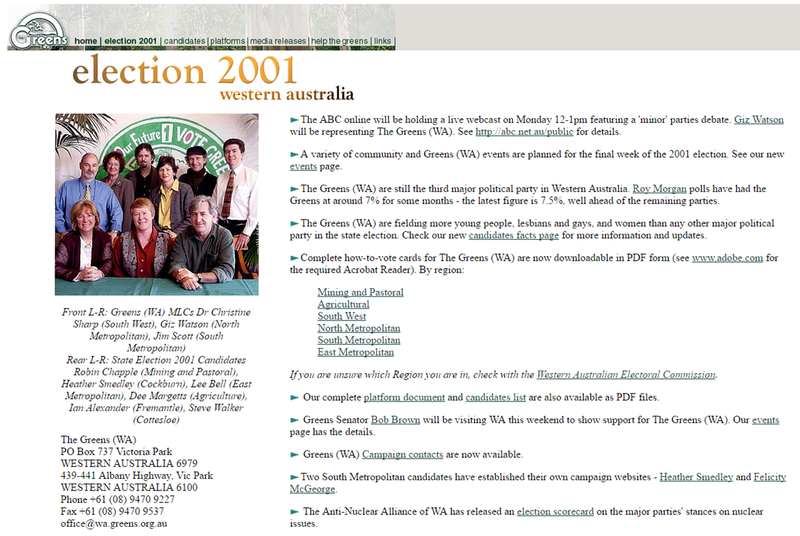 Below is how the websites of three state political parties looked at the time of the 2001 WA state election. 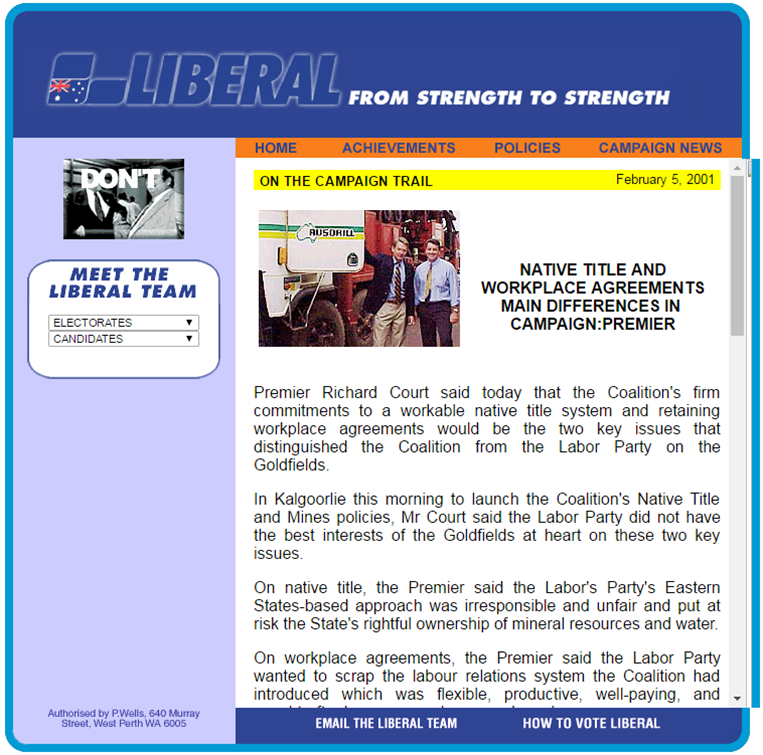 Compared to similar websites even during the 2008 state election and 2013 state election, they look very dated today, but that was the current state of the art in web design. With state and federal elections looming in the coming months, SLWA web archivists are already gearing themselves up to capture and preserve the next wave of election-related websites. The web is an integral part of contemporary life, and increasingly contains information and content that cannot be found in any other medium. By capturing Western Australian websites we are helping to preserve our digital history, culture and experience. Welcome to the Conservation Lab! We have been updating our space recently. We now have a redesigned space and new equipment to make our job easier and more efficient. Have a look at some before and after shoots below. As we use some of these fun new things we will post updates on this blog – so look out! The conservation team has the job of caring for the objects in the Library’s collection. We aim to minimise change to collection material and keep it in its best condition for people now and for generations to come. There are five full time staff; two conservators, a book binder and two conservation technicians. The work we carry out can generally be divided into two categories; preventative work or a treatment. Preventative conservation aims to avoid damage to items by looking after the environmental conditions, educating staff and clients about handling of heritage items, housing material appropriately and running an Integrated Pest Management program. As part of this program we inspect all items coming into the collection for bugs, mould and assess how dirty they are. Treatments may range from something very minor such as erasing an accidental lead pencil mark to a major treatment like rebuilding an item without all the original pieces. In our treatments we aim to use minimal intervention and for every treatment to be reversible.